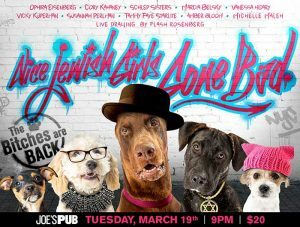 Nice Jewish Girls Gone Bad returns to Joe’s Pub just in time for Purim. The Badass Sisters of Schtick are back for a one night engagement to celebrate Purim, Shabbat and Sisterhood. Sixteen years ago NJGGB started at Joe’s Pub, a refreshing mix of comedy, music, spoken-word and show-stopping burlesque, featuring the gals who learned to smoke at Hebrew School, got drunk at their Bat-Mitzvahs and would rather have more schtuppa than the chupah, featuring performers seen on Comedy Central, HBO and Late Night TV. These badass chosen chicks boldly dare to deconstruct years of tradition, expectations and guilt in a fast-paced vaudeville extravaganza.You don’t have to be Jewish to love these broads. Nice Jewish Girls Gone Bad features a rotating cast of comedians. This show will feature: Ophira Eisenberg (Comedy Central), Tammy Faye Starlite, Cory Kahaney (Late Show, Comedy Central, Last Comic Standing), Vanessa Hidary (Def Poetry Jam), Marcia Belsky (Handmaiden’s Tale The Musical), Vicky Kuperman (She’s Got Issues), The Schlep Sisters (Burlesque Hall of Fame) and high jinx and kicks provided by Sister Schmaltz (Amber Bloom & Michelle Maleh), live drawing by Flash Rosenberg and hosted by Susannah Perlman (Last Comic Standing). Nice Jewish Girls Gone Bad has been spreading their own brand of nuevo schmaltz across the land. With a name Like “Nice Jewish Girls Gone Bad,” we get people out of the house and you don’t have to be Jewish to love the show, you will definitely feel Jewish after seeing the show. We have played in NYC, DC, Baltimore, Boston, Philadelphia, Seattle, Denver, Santa Fe, Vancouver, Providence, Miami, Minneapolis, Portland, San Francisco, Salt Lake City, Tucson, Chicago, Los Angeles, Toronto, Santa Cruz, Pittsburgh, Milwaukee, Phoenix, Park City, Detroit, Cincinnati, Montreal, Ottawa, Burlington, Lancaster, Victoria, Provincetown, Napa, Aspen, Vail, Bend, Taos, The Berkshires, The Hamptons, The entire state of Florida and of course, The Catskills. Audiences can’t get enough of these wayward girls! Nice Jewish Girls Gone Bad will donate proceeds from the upcoming performance to benefit New Light Congregation in Pittsburgh, PA. On October 27, 2018, New Light Congregation was one of the 3 synagogues affected by the tragic shooting that took the lives of 11 innocent souls. NJGGB’s host and creator Susannah Perlman’s brother, Rabbi Jonathan Perlman was in the building at the shooting. He was able to get to a few of his congregants and himself to a safety. Unfortunately 3 of his congregants were amongst the 11 victims. These men were pillars of New Light Congregation – Dan Stein, Richard Gottfried, and Melvin Wax. These men were so giving and selfless – they enthusiastically volunteered at every turn to keep the light burning and the spirit of New Light alive. NJGGB would like to help New Light rebuild and to keep the spirit of Dan, Rich, and Mel alive.